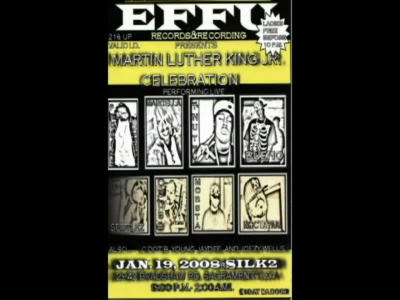 01-19-08 EFFU Records Martin Luther King Jr. Celebration. DrumTalk, Promize, Marcella, TNutty, Bueno, Spittlez, C-Dubb, Mobsta, Noctavius, C Dot B, Young Jaydee, and Joezy Wells. Filmed and Edited by Matthew Hollstein for 916groove.com.